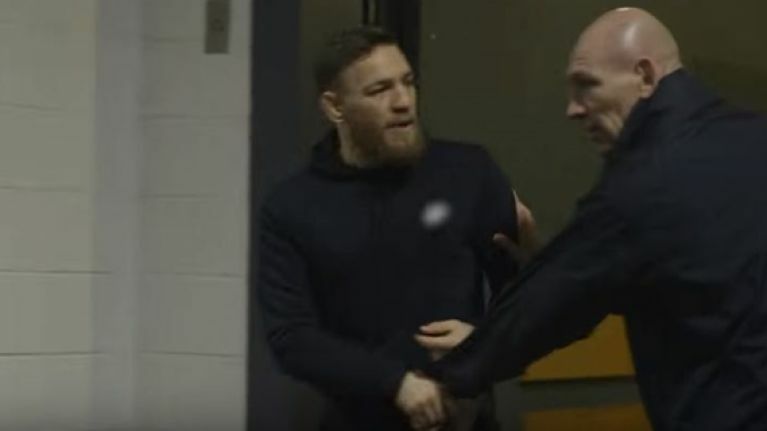 Conor McGregor arrived at UFC 223 a little later than anticipated. Conor McGregor was expected to show up during UFC 223 media day. Instead, he brought a posse that intercepted the red corner fighters' bus which Khabib Nurmagomedov was travelling on. He banged on the windows, screamed at his rival inside and threw a dolly through the window. Michael Chiesa and Ray Borg were forced to withdraw from their respective bouts due to injuries they sustained during the incident. UFC women's strawweight champion Rose Namajunas admitted that she came close to pulling out of her rematch against Joanna Jedrzejczyk. According to Ariel Helwani on the MMA Hour, showing up after media day had concluded was not part of the original plan. At least, that was what he was told. "I was told the original plan was to go to media day, not to go after media day but to go to media day." When the bus window shattered after the dolly collided, Artem Lobov's reaction was noteworthy. He stopped in his tracks, his eyes widened and he rubbed his face. This suggests that the 'Russian Hammer' was shocked by what happened. Max Holloway, who was on the blue corner fighters' bus, gave his account of what happened on the MMA Hour. He believes that McGregor didn't mean to break the window. "Imagine if they showed up to media day. That would have been even more wild... I don't think he really meant to break the bus or anything with the dolly. I think he was shocked that he broke it because when I was watching him, he actually picked up a metal trash can, he put it down and then he grabbed a plasstic trash can and he threw that instead. That was after the dolly incident. He was running with the barricades, like he knew he was going to get stopped with the barricades." Regardless of his intentions, McGregor did smash the window. The fact that he was caught on camera screaming, 'Smash the windows' doesn't help his case.